Abercrombie is a pioneering, upscale international tour operator that began by operating East Africa safaris in 1962. Founded by the Kent family who lived in Kenya, the firm continues to be chaired by their son Geoffrey Kent, born in Zambia and raised in Kenya. His former wife, Jorie Butler Kent, is vice-chairman. They are both owners in conjunction with Zhonghong Group. A&K markets high-end cruises, tours and independent travel arrangements to more than 100 countries on seven continents to individuals and groups, as well as through travel agents. A&K prides itself on using tour directors who live in the destination country, offering an excellent lecture/naturalist staff and keeping groups small. Behind-the-scene visits to museums, archeological sites, historic properties and native settlements are a trademark. For nearly all the programs that involve small-ship, river and canal cruises, land extensions are either an integral part of the tour or can be arranged privately. Generally, the trips are inclusive of shore excursions, bar drinks, table wines and gratuities. Cruise itineraries include Alaska, Antarctica, the Falklands and South Georgia, the Galapagos, rivers and canals in Europe, cruises on the Nile and the Yangtze, and expedition trips along the Pacific Rim. A&K Destination Management handles shore excursions for Azamara in Australia. Furthermore, Abercrombie & Kent develops and leads the land tours for The Scholar Ship, the university ship that provides educational cruises to an international student body. 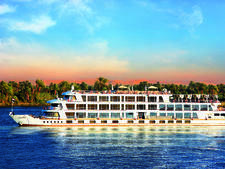 Abercrombie & Kent's cruises on Sanctuary Sun Boat IV provide an understated level of luxury along Egypt's Nile. Even more alluring, Sun Boat IV provides a staff-to-passenger ratio of 1.3 to 1. With such a variety of vessels and itineraries, there is no one onboard experience common on all Abercorombie & Kent sailings. Luxury canal and river cruising is nearly all-inclusive. Pricing includes accommodations, three meals with wine, guided sightseeing and entry frees. Even transfers and bar drinks are included on most vessels. An A&K cruise is a fully escorted journey. Such care, along with small passenger capacity, leads to a relaxed social atmosphere. Theme cruises are geared towards special interests, such as wine or horticulture. Qualified staff present lectures, facilitate discussions onboard, show videos and make themselves available for passengers' questions. Adventure sailings explore the Galapagos, Peru, Antarctica, Alaska and more. Sea sailings aboard either the 64-passenger Sea Cloud or 94-passenger Sea Cloud II are dually romantic and adventurous, reminiscent of the time of windjammers, yet with the high safety standards and luxurious comfort of modern cruise ships. Journeys include itineraries in the Mediterranean and Caribbean seas. All regular programs are in English; most well-heeled passengers come from the U.S., Canada, Britain, Europe, Australia and New Zealand. The ages will vary greatly depending on the type of trip and its length. The Galapagos cruises attract all ages including families, and Egypt increasingly gathers multi-generational travelers as well. The luxury tour line Abercrombie & Kent works with the cruise industry, offering chartered expedition, barge and river cruises around the world. Even if the company doesn't charter the entire ship, the "A&K" group has its own program, with a Resident Tour Director who hails from the region visited, as well as special meals and shore excursions. The group will have a staff-to-passenger ratio of 1.3 to 1. Abercrombie & Kent has charter and sub-charter arrangements with the ships and river vessels it uses. A&K uses Ponant's all-balcony expedition ships Le Boreal and Le Lyrial for its Antarctica programs, including those to South Georgia and Falkland Islands. Le Boreal has 132 cabins and suites, while Le Lyrial has 122 cabins and suites. Both ships are capable of carrying 264 passengers, but neither one ever carries more than 199 when cruising for A&K. The fewer passengers allows for more excursions each day. The 466-foot boats boast two restaurants, three bars, a panoramic lounge and terrace, an open bar, an outdoor heated pool, a fitness center, a 200-seat theater, a full-service hairdresser, room service 24/7, private butler service and a technologically advanced stabilizing system. There are scheduled bridge visits and plenty of places to meet and mingle, including a nightclub with live music and a dance floor. Ponant's L'Austral is used for other cruises too, such as A&K's Japan, Hong Kong and the Ryukyu Islands cruise. The mega-yacht L'Austral joined Ponant's fleet in 2011. The 132 cabins carry no more than 199 passengers in total. French bath products and robes are included, as are all gratuities, shore excursions and most bar drinks. Unique ports and secluded wilderness areas are explored, as they are only accessible via a small ship. Sun Boat III, A&K's Nile cruiser owned by Sanctuary, boasts a very chic design; a sophisticated and seamless mix of European, Egyptian and a bit of Bedouin. The 14 luxury cabins, two Presidential Suites with balcony and two Royal Suites with a shared balcony are all privy to an expansive Nile view. Egyptologists, which also serve as guides, are present for all excursions and are available for all 36 guests, the maximum amount of cruisers for Sun Boat III. There is a sun deck with a lounge, bar and a swimming pool with plenty of Egyptian day beds for all of its guests on deck. The sleek restaurant and bar cap off the elegant ambiance. When the tour company is on Sun Boat III on the Nile, the cruise is part of a larger Egyptian itinerary. Also on the Nile (and owned by Sanctuary), Sun Boat IV cruiser, was built in 1996 and holds 80 passengers in outside cabins with two picture windows. The ship features 36 doubles, measuring 196 square feet, while two sets of two suites measure 468 square feet and 638 square feet. Cabins have mini-bars, TVs with CD players, and hair dryers. There is a lounge, bar, library, dining room, outdoor swimming pool and gym, as well as ample deck space both open and under cover. Sun Boat IV cruises are a part of a larger Egyptian itinerary with extensions to the Middle East. A&K has 11 different European river cruise journeys that use boats from Amadeus: Provence (coming in 2017), Silver, Silver II, Silver III, Brilliant and Elegant. There can be as many as 150 passengers on the ship in total, but A&K limits its groups to no more than 24 guests. A&K provides its own Resident Tour Director on each of the ships with its tours that cater exclusively to the A&K group. They also provide a private vehicle for shore excursions, which are all A&K-exclusive. They offer private dining onboard the ship, with specially reserved tables, and the opportunity to dine at local restaurants, which others on the cruise are not privy to. European canal and river barges carry six to 22 passengers on waterways all over France, Germany, Holland, Eastern Europe, Great Britain and Ireland. The smaller barges are available for charter, and special themes may include food and wine, walking tours or art and painting. Exploring the cuisine of a region and sampling the food aboard the barge are often very important parts of these holidays. The Zambezi Queen is a 138-foot small cruiser, carrying as many as 28 guests on board. A&K limits its group size within the boat to no more than 18 passengers, along Botswana's Chobe River. The five-star, 14-suite cruiser feels much more like a chic boutique hotel than a boat. Each suite has its own private balcony and the boat comes with a small pool. The three-night cruise is a part of a larger itinerary, which includes a Southern African Rail program on Rovos Rail and a safari in Botswana's Okavango Delta, on either end of the cruise. For its Galapagos program, A&K uses the 48-passenger Ecuadorian-registered Xperience (formerly Eclipse), a 1,610-ton ship built in 1998. The four-deck ship has 26 outside cabins with windows or portholes, and two are reserved for singles. All public spaces are wood-trimmed and include a dining room, observation lounge and library. The crew numbers 29, and usually four naturalists accompany. Family departures are operated during school holidays. In 2017, A&K will take a maximum of 24 passengers along the Mekong to Saigon and Angkor Wat on the Mekong Princess. The ship has an indoor lounge, an outdoor observation deck, a library and internet center, a fitness center, spa and a restaurant. Each of the 14 luxury suites comes with a private French balcony. Although the all-balcony Sanctuary Yangzi Explorer can hold 120 passengers, A&K limits its own private group within the ship to just 18 passengers. The only five-star ship on the Yangze River takes passengers to off the beaten path and to the lesser-visited and best-preserved Mutianyu section of the Great Wall of China. An on-site archaeologist accompanies passengers as they view the Terra Cotta Warriors. The cruise is part of a larger itinerary exploring Beijing, Xian, Shanghai and is offered for families as well. A&K takes no more than 18 passengers on an 11-day journey to Myanmar (Burma), three of which are spent cruising the Irrawaddy River aboard the only all-balcony ship, Sanctuary Ananda. The all-suite, all-balcony ship has Wi-Fi in all of its suites (coverage is limited outside main cities of Mandalay & Bagan). It boasts the largest entry-level suites and the largest of any other suite (the Owner's Suite) on the Irrawaddy River. Expect out-of-the-way itineraries, as this boat was custom-built to navigate the Upper and Lower Irrawaddy and the Chindwin Rivers. Explore India's Taj Mahal on A&K's seven-night cruise on the Ganges River aboard the all-balcony Ganges Voyager I or Ganges Voyager II. The 185-foot ships can cater to as many as 56 passengers in total; A&K limits its group to no more than 18 guests. The boat has a restaurant, bar, spa, fitness center and sun deck. True to A&K, passengers are taken into the heart of rural India to lesser-visited villages and temples. Off boat, passengers 'Ride Like a Local' aboard river skiffs, street buggies, trishaws and a horse-drawn cart. The seven-night People to People cruise to Cuba on Le Ponant is limited to 58 passengers; the three-masted sailing ship carries 64. An A&K program director and cruise director accompany the trip. For cruises on the Peruvian Amazon, A&K uses Aqua Expeditions MV Aria. Built in 2010, the 16-cabin boutique-hotel-style boat boasts floor-to-ceiling glass windows in each suite. There's an indoor and outdoor lounge and an observation deck on the three decks of the cruiser. There are several excursions off boat, which involve skiffs and kayaks. While itineraries are world wide, cruise programs vary and may include any of the following: a cruise, a cruise with a short hotel stay or a cruise that is an integral part of a much wider land tour. The Safari Quest, a very small yacht, cruises along the Inside Passage of Alaska and caters to 20 or fewer passengers. Shore excursions include double-kayak adventures, a keeled tender trip and on-shore hikes. In the evenings, passengers can watch documentaries onboard. In the Galapagos, the 48-passenger Eclipse operates weekly trips with Darwin Station naturalists taking passengers ashore to visit the island wildlife. Some excursions may involve Zodiacs or wading and swimming to see the marine life. In Antarctica, passengers go ashore from the Minerva in Zodiacs to get close to several different types of penguins, seals and bird life. Naturalists provide lectures while the ship is at sea or crossing the Drake Passage. Longer trips include visits to the Falkland Islands for the bird life, to the remote English-speaking community at Port Stanley and to South Georgia, a former whaling station known for its teeming bird life and connections to the Ernest Shackleton Expedition. In Egypt, the Nile cruise portion includes Aswan, Luxor, Kom Ombo, Edfu and Esna with, at the minimum, an additional hotel stay in Cairo. Longer tours will include Abu Simbel and neighboring countries such as Jordan and Syria. In Europe, barges cruise rivers and canals in a half-dozen locations in France, plus Germany, Holland, Eastern Europe, England and Ireland. Barges are available for charter or individual booking. Touring is by motor coach, by bicycle and on foot. Special themes include wine and food, walking tours, art and paintings, castles, and historic houses. On the Yangtze, the cruises usually last about four days and include the Three Gorges, the new dam, villages and towns, canyons, and religious sites. All form just a part of a much longer China itinerary that may also include Tibet and Mongolia. In Asia, the Clipper Odyssey provides a comprehensive small ship cruise experience in Japan, South Korea, China, Southeast Asia, Australasia, and the Russian Far East. The departures operate like expeditions with a specialist lecture staff and a shore program.